This entry was posted on March 28, 2013 at 1:00 am and is filed under Thursday Tangents. You can follow any responses to this entry through the RSS 2.0 feed. You can leave a response, or trackback from your own site. To add to the fun here, I have a friend who shares the same first name, John, and to avoid any confusion, he was to be called Big John (for he was nearly a foot shorter than me and very thin) and I was to be Little John, just like in many Robin Hood tales. Unfortunately, I had another friend, Cynthia, who was from Mexico, and she was utterly confused by why the literal, little John was called Big and my myself Little. We tried explaining, but she refused and said it made no sense. So in this rather odd case for us, the little is Little John and I am Big John…Just thought I would share! Love your blogs, Jane! It’s not just electricians who get called “Sparky.” A grad student I knew had a lab fire in front of students in a lab (something about heating a beaker of pure ethanol directly on a heater, not in a water bath), and he became Sparky for the rest of his grad school experience. Given that he drank at least a liter of coffee per day, it suited his personality too, unfortunately for him. I sometimes think that names are the wildest and wooliest aspect of etymology. I have no doubt that Maryann, as Jane has encountered it, is a new back-formation from Mary Ann. Which is interesting considering how common Marianne and its variants are as a European name, along with forms like Marie-Anne or Maria Anna, which, AFAIK, really are compounds of Mary and Anne. The ironic thing is that the Semitic original is Maryam, which looks as if it should be the parent of all of them. In fact, looking at all that, I wonder if the notion that Mary’s mother was named Anne doesn’t derive from some Greek’s confusion over the original name, since it seems there’s no canonical source for it. My slang dictionary, which is British-based (Partridge’s, as I recall) has many entries saying something to the effect of “____: inevitable nickname of anyone surnamed ___”, generally with no explanation of why it’s inevitable. Also, in exploring hobo namesI found a fair number of examples where the name was descriptive (i.e. ‘Blink’ or ‘Blinky’ for someone who’d lost an eye) but also the cross-naming John talks about (naming a tall person ‘Shorty’). 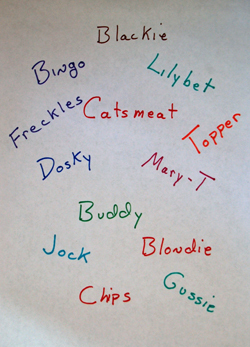 I think ‘Bud’ and ‘Buddy’ tend to be a form of ‘Junior’, like Chip. Though I have to say I never understood the significance of ‘Chip’ before. Interesting insights, and I shall add my own experiences because… you know what, I don’t even know. My brother had the same problem as James. But it was solved pretty soon after birth. Both he and my dad share the name Michael. No long after my brother was born, my parents decided my dad would be called Mike. I don’t know anyone who knows my dad that calls him anything else anymore. Though when we get into things of legal or contractual statue (I.E. cell phone bills), we have to include the full legal name. Thank goodness for middle names. Also, I my will often call my older brothers “big brother” and “biggest brother” (Guess which goes to which. 😀 ). I don’t know if they know it, but to me, it’s my way of expressing great affection. In the same spirit, I sometimes call my aunt Rochelle Auntie R (inspired by Wizard of Oz…. sort of), though not as much since she doesn’t care for it as much.